The journal Egitania Sciencia, property of the Instituto Politécnico da Guarda (IPG), is a periodic publication that represents a constant commitment to support and promote research activity, not only the one developed within the Research Unit for Inland Development of IPG, but also by other national and international researchers, whose contribution is beyond questioning. Egitania Sciencia Journal as a scientific and technological broad character with the purpose to promote scientific and applied research, seeking to communicate knowledge and contributing for the qualified research and field studies development, fostering work methodologies and different types of cooperation, as well as the articulation of knowledge share and network research . The journal aims to publish findings and exchange knowledge on the development of new research theories, methodologies and applications. In this vein, the journal welcomes and accepts papers for publication that use a wide variety of research methodologies including: conceptual papers, empirical studies based on both qualitative and quantitative methodologies, experimental, case studies and strategy-oriented contributions. The published papers should clearly address the practical implications of the research reported. In the special issues the journal will have specific editors responsible for the publications. 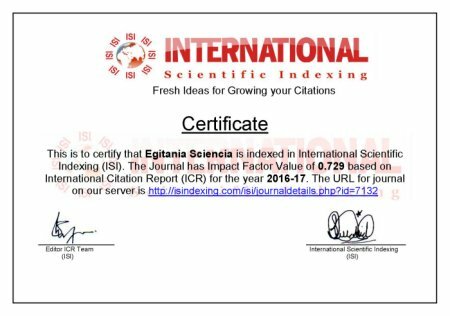 These editors are defined by the expertise area of their curriculum and the scientific subject of the special edition of Egitania Sciencia.